An Administrative Assistant is a job position in the administration framework of a firm. This is considered as quite a lucrative position since it comes in regular contact with high positioned individuals in the firm. 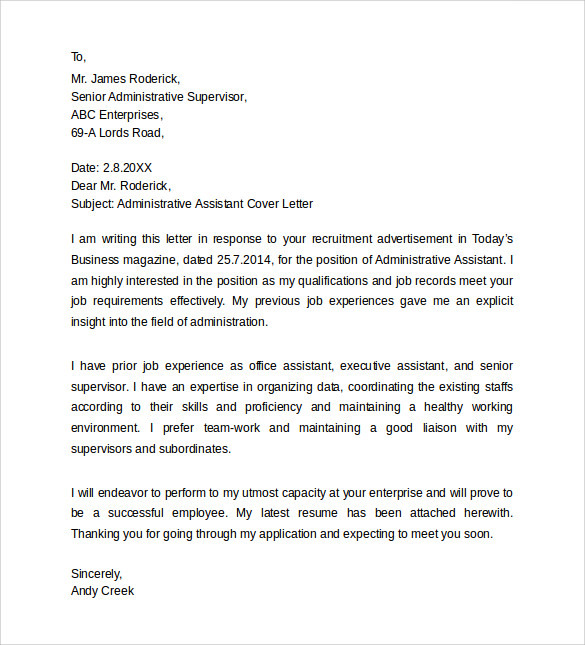 While applying for such a job it is important to include a Cover Letter Examples along with the complete Curriculum Vitae. The language, presentation and mannerisms expressed through the cover letter yields a higher chance of getting selected for an interview, which is one step closer to being hired. A proper cover letter may be hard to draft from scratch so here is a bit of help. 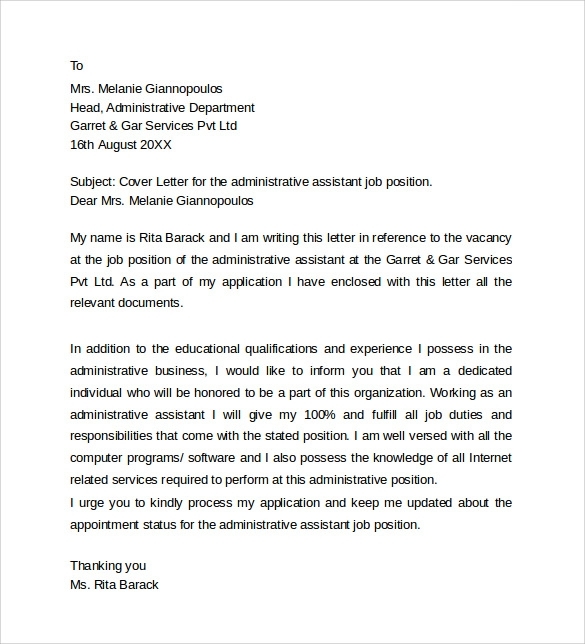 This free sample cover letter for administrative assistant position is based along the guidelines of a normal cover letter. The letter begins with the address of the employer, followed by a subject and the name of the person. The rest of the body of the letter follows a predisposed pattern; introduction, body and conclusion. There are many positions as administrative assistant this one an entry level administrative assistant cover letter. After formally addressing the employer the first paragraph states how the applicant came to know of the vacancy and a formal introduction. 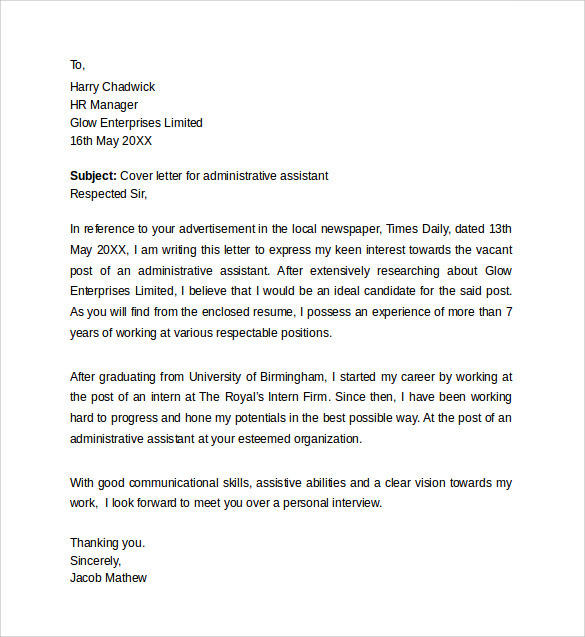 This is succeeded by a body of content and ends on a thanking note to the prospective employer. 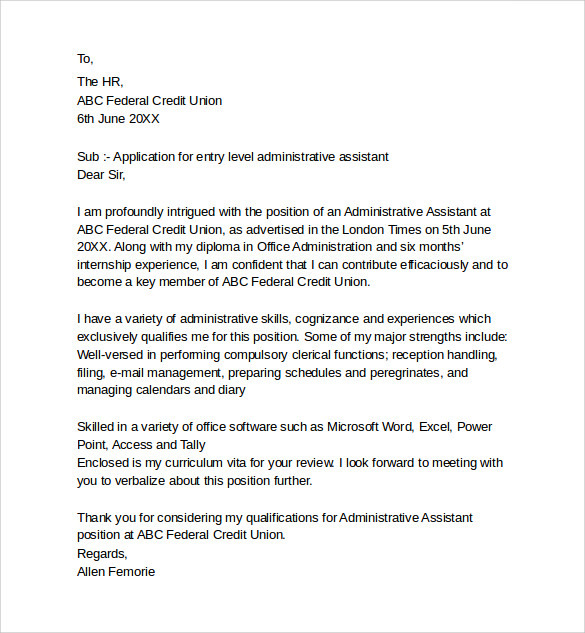 Out of all the administrative assistant cover letter examples this template follows an easy straight-cut simple pattern. A humble introduction after properly addressing the employer and one more paragraph explaining what the job means to you, that’s what constitutes this template. The language has been kept fluid, courteous and humble. 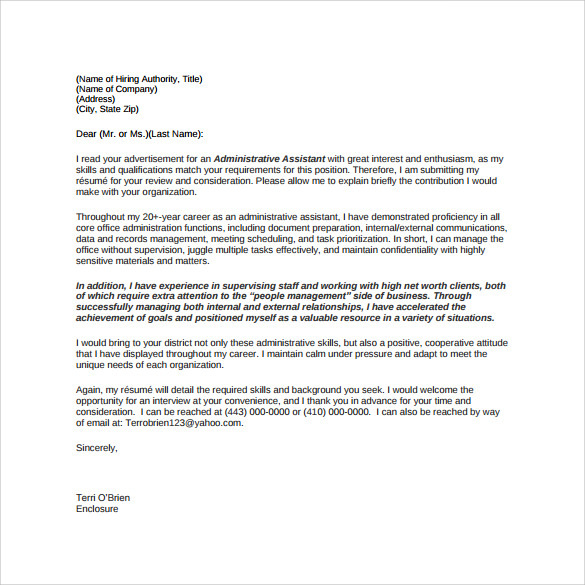 This administrative assistant cover letter sample is a complete finished professional letter. The only things not included are the specifics i.e. the names, dates and contact information. Once an user has downloaded this template they can easily open the document in MS word and add the necessary changes needed to it. Applying for a new job is always difficult, especially more so when it is in the administrative department of any reputed firm. The administration is responsible for keeping in check the day-to-day activities of the business and to provide the framework within which the management must operate. The Administrative assistant Communication Cover Letter is the link between the administration and the workers, employees or other 3rd parties. These templates are widely popular since they portray a ready-to-use fully official cover letter where the applicant simply has to edit and insert his own personal information. The mistakes any novice applicant might make are removed by these templates. The target audiences for these templates are obviously newly applying novice workers who have no prior knowledge or expertise. While preparing a resume and writing a Marketing Assistant Cover Letter it is easy to make minute mistakes, but these minute mistakes may later end up being quite crucial. 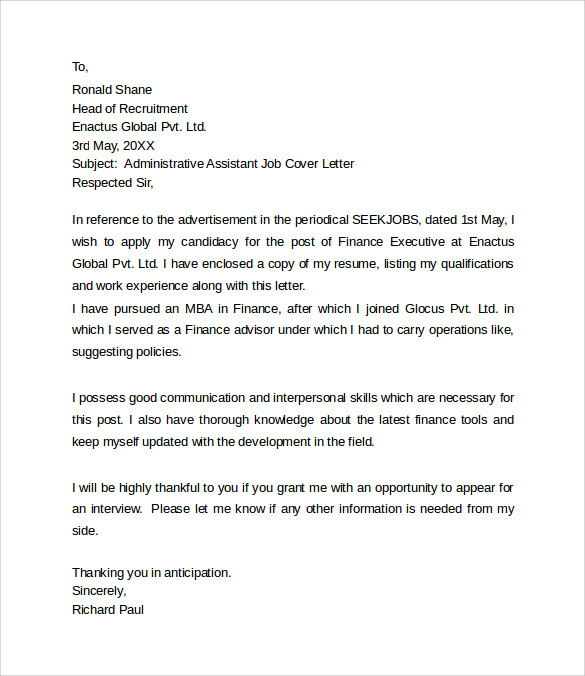 To ensure that the applicants produce mistake-free cover letters in a short span of time with minimal effort these templates have been designed. Though they all follow the basic writing pattern of a cover letter each one differs from the other in one major aspect or more. 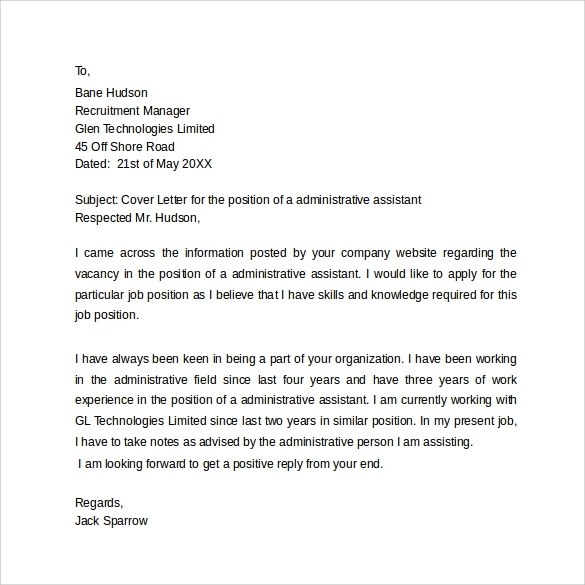 It is up to the applicant to choose the cover letter which suits him best, for guaranteed results. The benefits of these templates are manifold, in the sense they make writing a curriculum vitae easier, takes care of unwary mistakes a human can make, speeds the process up considerably faster. 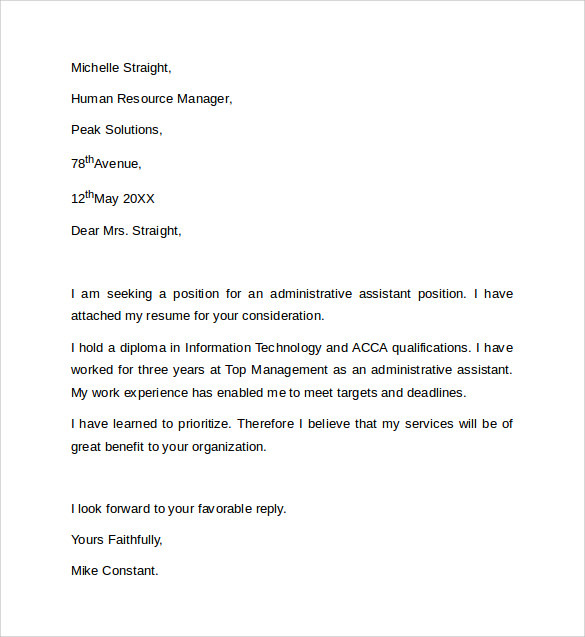 Instead of spending a lot of time on one application where the applicant has lots more to send in it is logical to use Administrative Coordinator Cover Letter examples or templates available for download from the internet. The large array of options to choose from ensures the applicant their perfect match of cover letter. Once downloaded the applicant simply has to edit out the vague portions and include real and factual information. This being done, the job is complete and in a fraction of the original time. It can be concluded that these templates are immensely helpful to those who seek a job in the administrative sector as an assistant. A qualified human being may lose their chance at a job because of a silly mistake made during hurriedly typing out the cover letter. But using these templates ensures that no such mistake will take place and guarantees best results.